UKIAH, CA 2/27/18 — In a brief proceeding of the Mendocino Superior Court, this afternoon, Negie Fallis, 37, the primary suspect in the disappearance of Khadijah Britton, had his arraignment postponed until Friday. Fallis was scheduled to be arraigned today, but at his appearance he stated that he had not been able to retain his own lawyer. As a result a public defender, Christiane Hipps, was assigned to him. Hipps will represent him at his arraignment at 1:30p.m. on March 2. Judge Cindee Mayfield presided and Mendocino County District Attorney David Eyster himself was the prosecutor. Khadijah Britton, 23, is the Covelo woman who has been missing since Feb. 7. Since then the Mendocino County Sheriff’s Office has launched an extensive search, with help from the Round Valley Tribal Police, and some support from the FBI. An outpouring of grief and support has been seen from the community in Covelo and all of Mendocino County, and an award of $50,000 dollars is being offered for any information leading to the discovery of Britton. According to witnesses, Fallis allegedly accosted Britton on Feb. 7, at the home of a friend, then forced her at gunpoint into a car. She has not been heard from since. He was arrested by Tribal Police on Feb. 19th and has been in custody since. However, Fallis is not scheduled to be arraigned on charges stemming from Britton’s disappearance. Instead, the charges allege that on Jan. 29 he committed the crime of “kidnapping” (P.C. section 207a), took her to another location, then allegedly beat her with a hammer. This constitutes a separate charge, assault with a deadly weapon (P.C. 245a1). Altogether the D.A. is charging him with five separate counts stemming from the Jan. 29 incident, not the alleged Feb. 7 incident: kidnapping, assault with a deadly weapon, corporal injury to a spouse (P.C. 273.5a), burglary in the first degree (P.C. 459/460a), and making a criminal threat, in this case allegedly threatening great bodily harm or death to Khadijah Britton (P.C. 422). Around 40 family members and friends then shuffled into courtroom B of the Mendocino Superior Court, to watch the arraignment, with several more left in the hallway, and still others left outside on the courthouse steps. Many of them wore red shirts, and a greater number had yellow ribbons pinned to their chests. At least 12 MCSO deputies were present in the courtroom, which, for all the tension remained absolutely quiet during the proceeding. Fallis’s grandmother was also in the courtroom. Altogether it seems that somewhere around 70 people, mostly from Covelo (an hour and a half drive from Ukiah) were present at the courthouse in a show of support for Britton. Outside on the courthouse steps a group of young woman had made posters and passed our yellow ribbons, and someone else burned sage. Several older people stood on the sidewalk of State St., where they had been since 8:00a.m, as cars honked. The arraignment (and so the vigil) had originally been scheduled for 9:00a.m. When asked for comment many family members were overcome with emotion, and those who did comment expressed sadness mixed with hope that some new information might lead them to Khadijah. Fallis was brought into the courtroom wearing orange pants and a black and white striped prison uniform. He stood quietly with eyes averted during the proceedings, speaking in a low voice. The judge asked if he had been able to retain council, and he said that he had not. He was then assigned a public defender, Christiane Hipps. She and D.A. Eyster agreed to move the arraignment and the bail question to Friday, giving her time to prepare. 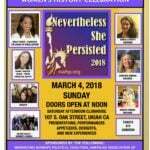 The Mendocino County Sheriff’s Office is the lead agency in the investigation and should be contacted with any information about her disappearance by calling (707) 234-2100 or emailing [email protected] Her family can also be contacted by calling Connie Hostler at (707) 621-2345, or Jerry Britton at (707) 354-2843. 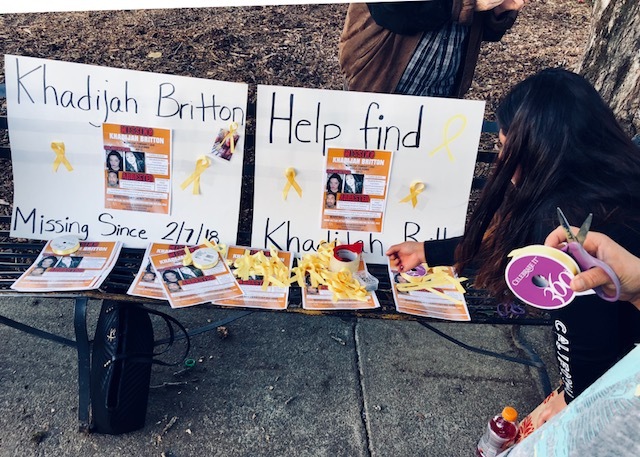 A Facebook group called “Help Find Khadijah Britton” has been set up, as well as a GoFundMe page. Too see a comprehensive list of our previous coverage click here.